Related articles: AV blocks, First-degree AV block, Second-degree AV block. With third-degree (complete) AV block a complete failure of the AV conduction occurs. None of the supraventricular impulses are conducted to the ventricles, so the atrial and ventricular activities are independent of each other 1 2. The atria are stimulated by the sinus node, if no other alteration is present, while the ventricles are stimulated by a subsidiary pacemaker distal to the site of the block. Morphology and rate of the ventricular rhythm, also called escape rhythm, depends on the origin of the escape pacemaker (AV junction, His bundle, or bundle branches). PP and RR intervals are regular. P waves bear no constant relation to QRS complexes. Atrial rate is greater than ventricular rate. Morphology and rate of the ventricular rhythm depends on the origin of the escape pacemaker. The escape pacemaker usually originates from a site just distal to the block. If the AV block is within the AV junction, the escape rhythm has narrow QRS complexes unless bundle branch block coexists. 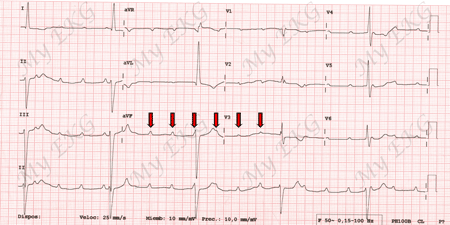 If the block is below the bifurcation of the His bundle, the QRS complexes are wide. Therefore in the presence of complete AV block, narrow QRS complexes indicate an AV junctional location of the block, but wide QRS complexes may be the result of bilateral bundle branch block or AV junctional block with a bundle branch block 3. The heart rate (ventricular rate) associated with third-degree AV Block usually depends on the origin of the escape pacemaker. Atrioventricular dissociation. Escape rhythm with narrow QRS complexes and rate of 29 bpm. The rate of AV junctional escape rhythm is usually 40 to 60 bpm. The rate of the ventricular pacemaker is usually less than 40 bpm 3. Patients with atrial fibrillation or atrial flutter may also have complete AV block. In the presence of complet AV block, the ventricles are driven by AV junctional or ventricular escape rhythms, as patients without AF 3. On EKG there is minimal or no atrial activity (f waves or absence of P waves) with rhythmic and slow ventricular rhythm. AF with slow ventricular rhythm (44 bpm) and constant RR intervals. Ventricular rhythm in atrial fibrillation is arrhythmic, even at slow heart rates. When a patient has atrial fibrillation with rhythmic and slow ventricular response, is probably caused by a third-degree AV block. Third-degree AV block is more difficult to diagnose with atrial flutter, which is usually rhythmic. Complete AV block should be suspected in patients with atrial flutter with marked bradycardia (less than 40 bpm) when the flutter waves (F waves) should have no demonstrable relation to the QRS complexes 3. Atrial flutter with slow ventricular response (44 bpm). It should ruled out that bradycardia is caused by antiarrhythmic drugs commonly used in atrial flutter 4. Conduction system sclerosis (Lev's disease or Lenegre-Lev syndrome). Medicines: betablocker, verapamil, diltiazem, digoxin. Valvular heart disease: aortic stenosis, calcification of the mitral valve, endocarditis. After heart surgery or percutaneous valve replacement. Patients with third-degree atrioventricular block (complete AV block) without pacemaker implantation have a poor prognosis, especially if they presented symptoms (syncope). Their survival in the first year is less than 50% compared with same age population 5. Therefore, permanent pacemaker implantation is indicated in patients with third-degree AV block irrespective of symptoms 6. 1. Goldberger A, Goldberger Z, Schvilkin A. Clinical Electrocardiography: A Simplified Approach, 7th ed. Philadelphia: Mosby Elservier; 2006. 2. Castellano C, Pérez de Juan MA, Attie F. Electrocardiografía Clínica, 2ª Ed. Madrid: Elservier España S. A. ; 2004. 4. Newcombe CP, D. De Souza D, Towers JRH. Atrial Flutter with Complete Heart Block. Br Heart J. Nov 1960; 22(5): 691–694. 5. Vogler J, Breithardt G, Eckardt L. Bradyarrhythmias and Conduction Blocks. Rev Esp Cardiol. 2012;65(7):656–667. 6. Brignole M, Auricchio A et al. 2013 ESC Guidelines on cardiac pacing and cardiac resynchronization therapy. Eur Heart J; 2013.